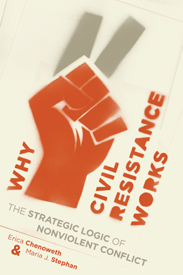 My book, Why Civil Resistance Works: The Strategic Logic of Nonviolent Conflict (with Maria J. Stephan) is now available for sale at Columbia University Press. If you enter the discount code WHYCH, you can get a 30% discount. Or buy it at Amazon.